With the terrific natural landscapes, a hike with your canine friend(s) around Lake Windermere represents one of the most scenic paths you can tread in the UK. How do you make a walk with your dog even more rewarding? Stopping off at the best dog-friendly pubs of course. Whether it’s part of your next Lake District break or daily excursion, we’ve created a pub trail that you can experience every step of the way with your pooch. 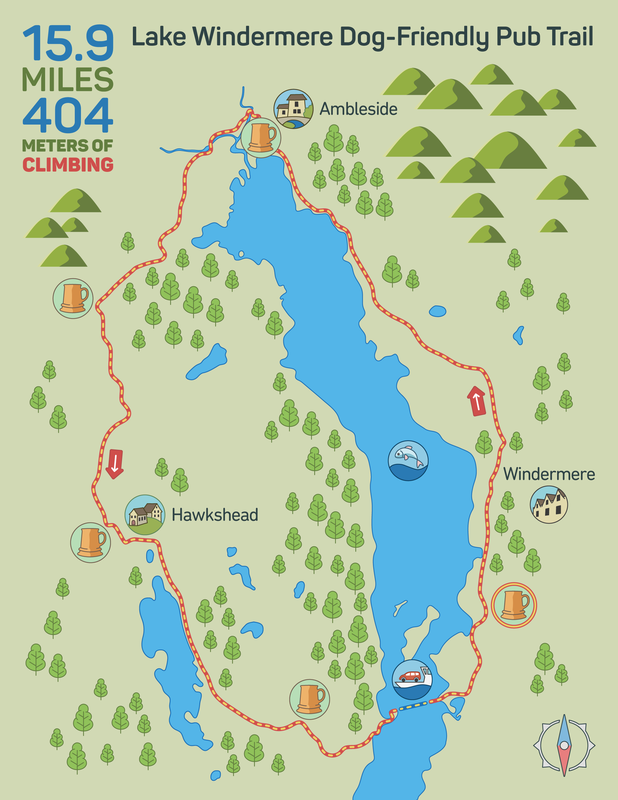 Starting and finishing at The Angel in Bowness-on-Windermere we’ll take you on an anti-clockwise trail through the top half of Lake Windermere, making your way north towards Ambleside, before climbing into the hills that overlook the lake above the western shores. From here you’ll move south through the picturesque countryside in Barngates and Hawkshead before passing Esthwaite Water into Far Sawrey. The trail culminates with a pedestrian ferry cross over Lake Windermere as you make the return back to Bowness. Although the route can be accomplished in a day, it’s equally as enjoyable to break up over a few days to get a better taste of what these pubs and their localities have to offer. Continue reading to discover more about the trail and the watering holes you will pass on the way. 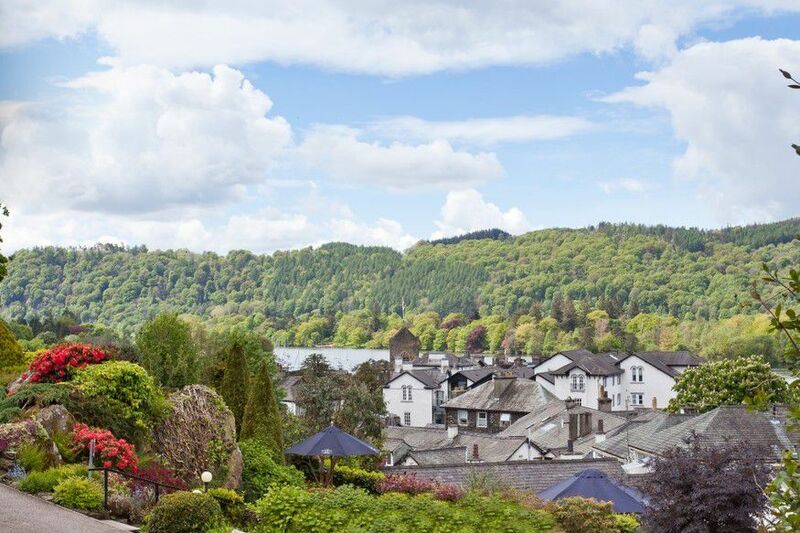 Bustling with holiday apartments and lodges, Bowness is at the heart of many peoples Lake District holidays. With the wide range of amenities, it makes the perfect destination to commence your planned activities, which is why our trail begins and ends here. 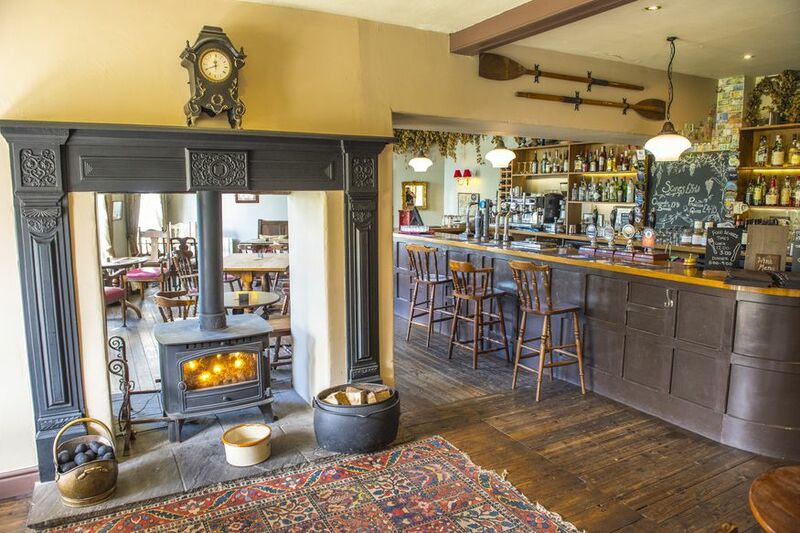 The Angel Inn is a stone throw from the shores of the lake, benefitting from beautifully landscaped gardens and an immaculate interior, of which dogs are more than welcome in the bar lounge to enjoy a pint of real ale in the comfort of the cosy log fire. 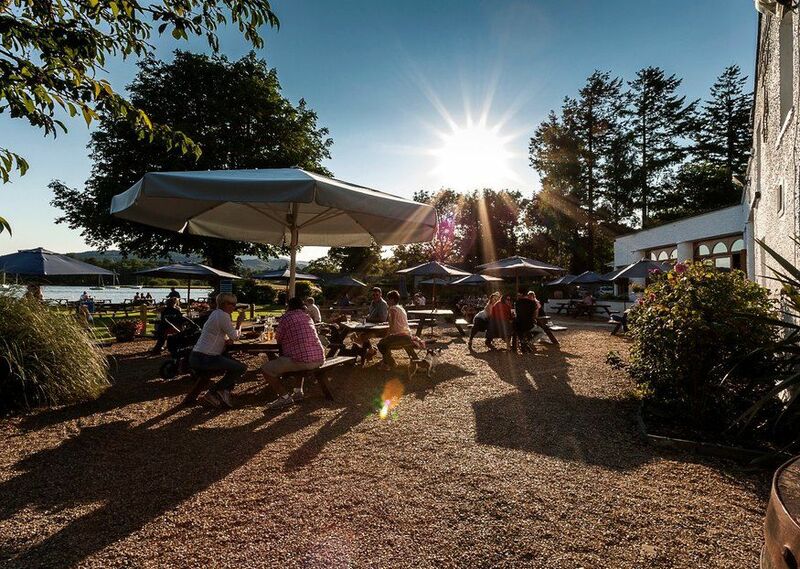 The large beer garden catches the sun throughout the day and is the perfect place to relax at the end of your walk, taking in the sunset over Claife Heights. On another day you could let the hours pass by, perhaps save these thoughts for when you return here at the end of the trail. So grab those backpacks and dig out the lead, let’s commence the walk via Rayrigg Road and head towards Troutbeck. The first stretch of the trail keeps you close to the Eastern shores of Lake Windermere before crossing Troutbeck Bridge and passing White Cross Bay lodges. 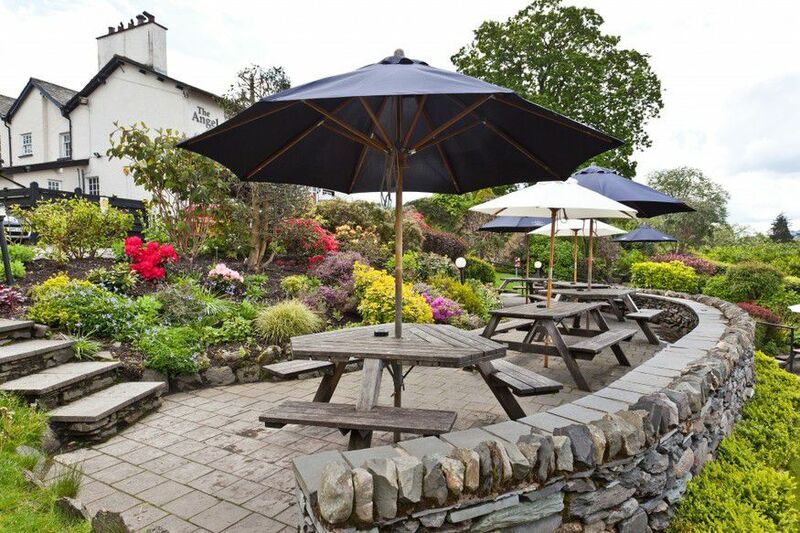 Right at the tip of Lake Windermere sits the Wateredge Inn, a homely pub with uninterrupted views of the lake. If you’ve ever seen a tranquil shot of a jetty stretching out into Lake Windermere, there is a good chance it was captured close to the Wateredge Inn. You’ve just completed the longest single stretch of the trail, so what better excuse for a liquid refreshment. Serving 5 real cask ales at any one time with water bowls for dogs, take the time to breathe in the enchanted view all the way down the lake, adorn with mountains, fells and forests. Whilst a relatively short distance the road up to the Drunken Duck Inn involves a climb of around 130 meters. But don’t worry, it is not without reward. As you reach out of the trees at Pull Wood the uninterrupted views looking out from Barnsgate over Lake Windermere are something to behold. 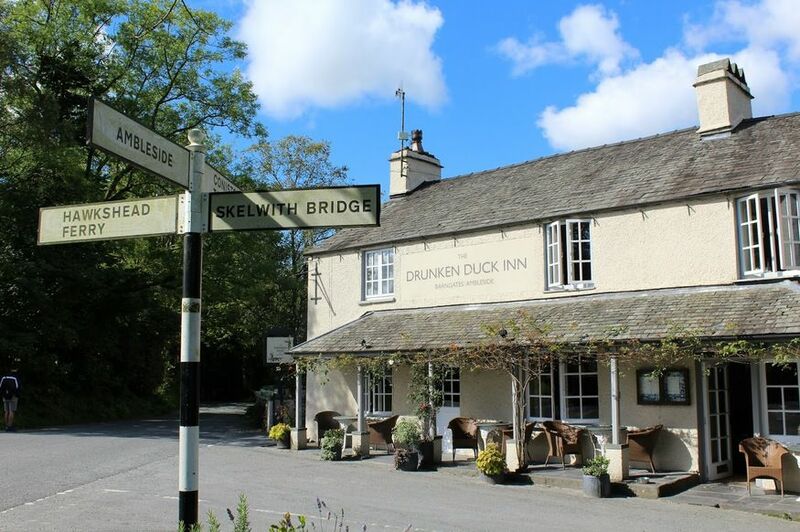 If real ale is your thing, why not try some of the great beers brewed at The Drunken Duck. You can’t get much more local than that! 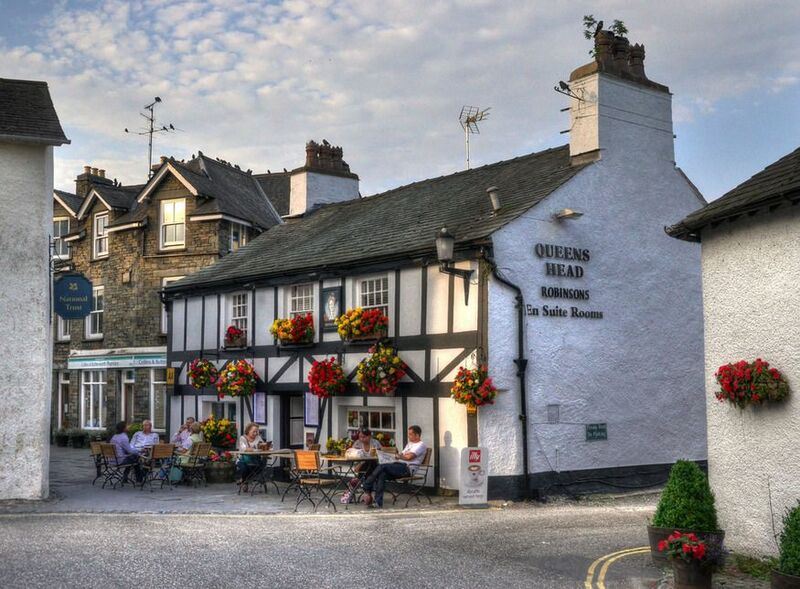 Dogs are welcome in the bar and if you’re feeling peckish at this point in the trail, you’ll be glad to know that you can even take your (well behaved) 4 legged friend into the restaurant to experience one of the most acclaimed eateries in the Lake District. With its whitewashed houses, cobbled alleyways, narrow courtyards and squares, it’s not hard to see why Hawkshead is often described as the most picturesque villages in the Lake District. The journey from Barnsgate is a gentle stroll passing through Outgate and the windy roads that line this part of Cumbria. Cars aren’t allowed in the village, making it the perfect spot to enjoy a quiet drink while you watch the day go bye. Whether it’s the courtyard beer garden or the cosy interior, dogs are more than welcome visitors. Part of Robinsons Brewery, meaning you’ll be spoilt for choice when it comes to signature ales along with some nice surprises. Descending from Hawkshead following the B5285 you’ll pass another wonderful lake in Estwaite Water before reaching Beatrix Potter’S historic Hill Top House. From here is a short journey through Near Sawrey into Far Sawrey where you’ll discover the Cuckoo Brow Inn. With its log fires and rustic charm it’s easy to see why many say we’ve saved the best dog-friendly pub in Windermere till last. Dogs are welcome throughout Cuckoo Brow Inn, however, we recommend the stables lounge for its unique character and appeal. Should you be feeling weary from the journey so far you can find comfort in knowing the final stretch is largely downhill and you’ll be rewarded with beautiful views as you cross the lake by boat. Allowing for a half hour ferry crossing (although this could lengthen depending on your wait for the ferry to arrive) the trail concludes with a gentle, flat walk back into Bowness-on-Windermere. We recommend making a return to The Angel Inn, the perfect place to watch the sunset over Lake Windermere as you reflect on your journey around England’s largest and most beautiful lake. This entry was posted in Pet Owners. Bookmark the permalink. Travel writer and unashamed Star Wars geek. Usually found holding a pen or dog lead, sometimes both.